I haven’t picked up my needles this week, which makes me sad. I’ve been wanting to blog, but I couldn’t come up with anything to show you! So yesterday I decided that even if I didn’t have any knitting, I could at least post a few pictures of knits, to continue with my occasional posts that feature knits-in-action. Mara-in-action. Whenever I wear this, I am happy. 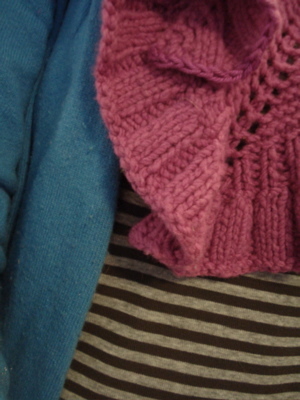 The cheeriness of the pink, the squish of the beaverslide — this shawl generates happiness. And now, a confession. 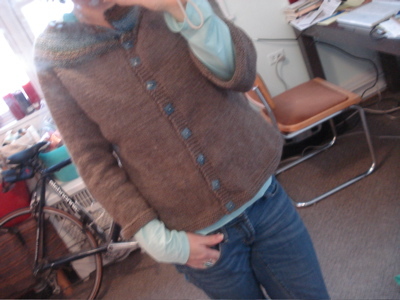 I haven’t yet worn my garter yoke cardigan out of the house. I’ve worn it several times, but only when I am home. 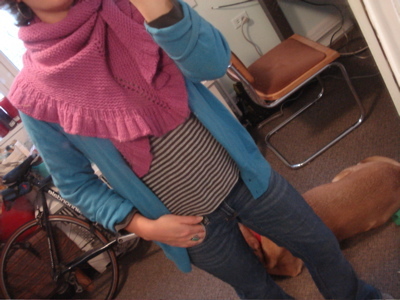 I love the squish, I’m thrilled with the handspun yoke, but the fit just isn’t quite right on me. Something about it being too big to be a fitted cardigan, and too small to be a slouchy cardigan. See? Now, insert an appropriate transition here, because I don’t have one. 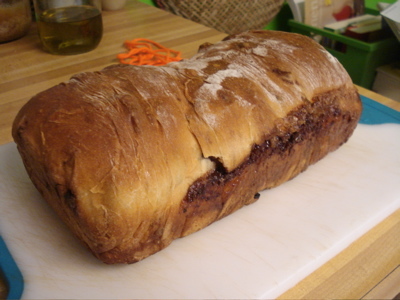 For my birthday, my friend K. baked me the most delicious cinnamon raisin swirl bread ever. I have been eating it for breakfast, snack, and dessert. (Well, and I might have eaten some of it as part of a breakfast-like dinner on Tuesday. But don’t tell anyone.) In fact, I intend to eat the last two slices for breakfast in a moment. More knitting soon, I hope. This entry was posted in knitting and tagged birthday, bread, garter yoke cardi, handknits, knits in action, mara by barefootrooster. Bookmark the permalink. Your Mara is so gorgeous. I love Beaverslide. I agree on blocking for narrower/longer, even if only the body. You could always pick up and knit another inch or more of garter on the bottom if that fails. The cardigan is beautiful, but I see what you mean. It flares some around your hips in a way you don’t need…. I think if you blocked it longer rather than wider you would be in good shape! It does flare around your waist, but I think you’re right that the blocking could help. Best of luck! Well, I still think the garter yoke cardi looks great on you, but the blocking idea sounds like a good one for a more fitted look. I have used the aggressive blocking technique before to make something longer and narrower, and it can definitely work. Mara + you = made for each other!! Do whatever you need to do to be able to wear your GYC. I wear mine all the time and I hope you find a way to wear yours, also!! Happy belated birthday! That cinnamon bread sounds wonderful. Mara looks so cute and cozy, doubly so since it packs a punch of bright color at this time of year. Hmmm… I see what you mean about the garter yoke cardi. Is the whole thing too big, or just the body? Could you rip it back and knit the body narrower? I think it’s worth trying to block it, but I’m guessing it will grow as it’s worn. Your Mara is gorgeous and the color is lovely. As for your sweater, a good blocking can’t hurt and maybe over time your grievances with it will fade and it will be your perfect lazy day sweater. I love your Mara and I think the sweater looks good on you. Happy belated! I love the expression on Boh’s face as he guards your knitting in yesterday’s post. Such an old soul I think. And that bread looks awesome!! Your mara is lovely! I hate the funky-fit sweater. Maybe blocking is just the thing? Or just more swirl bread? Love your Mara! Go with the blocking of the sweater and see what happens. Fingers crossed. I have always loved Cinnamon Raisin Swirl bread. Reminds me of when we would come back to the US from Europe every 3 years as a child. The loaf would disappear lickety split! Mara looks great! Happy belated!! Did you have problems with the Mara? Looked at it on Raverlry and seemed like there were errors in the pattern–at least in the beginning. I’m not good enough to figure out errors on my own. Loved it, by the way, and would like to try one. mara looks great as does the new short hairdo and will be much easier to care for good on you. Mine has not been cut for nearly 13 years now and it is possble time to get it all off again but i dont know it will be so grey then and much harder for me to look after so used to it the way it is.